Cllr. 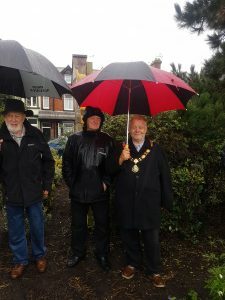 Markley, Mayor of Silloth was joined today by a few brave souls, who turned out to see the flag raising ceremony on Silloth Green, on what was a particularly wet morning. 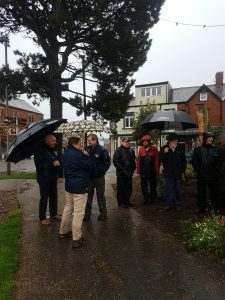 Silloth Green is among a record-breaking 1,883 UK parks and green spaces to receive a prestigious Green Flag Award – the mark of a quality park or green space. This international award, now into its third decade, is a sign to the public that the space boasts the highest possible environmental standards, is beautifully maintained and has excellent visitor facilities. 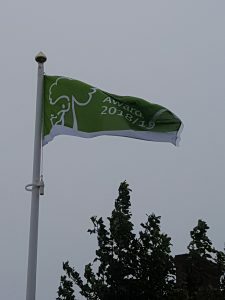 This is the sixth year in succession that Silloth Green has been awarded a Green Flag which is a brilliant achievement and would not have been possible without the hard work of our community volunteers, grounds maintenance team and Town Council staff. 3rd September 1939 marked the outbreak of the Second World War and is now enshrined as ‘Merchant Navy Day’ to honour the brave men and women who kept our island nation afloat during both World Wars, and even during peacetime faced – and continue to face – the more routine perils of violent storms and mountainous seas. The expansion of Silloth-on-Solway into a planned Victorian town in the mid-19th century was inextricably linked to the development of the Docks, the Harbour and the Railway. Silloth retains a busy working port, an active Lifeboat Station with its dedicated volunteers and a small fishing fleet. 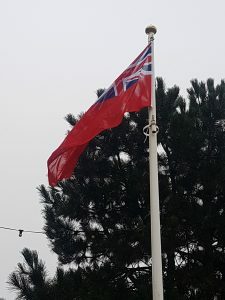 A Red Ensign, or ‘Red Duster’ as it is affectionately known, is the recognised flag of the British Merchant Navy since 1854. 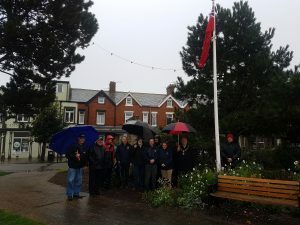 The Red Ensign flag was raised on Silloth Green – to celebrate both a glorious seafaring past and a vital part of our economic future. 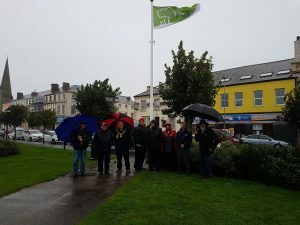 Many thanks to everyone who attended the flag raising ceremony.